Mae Ngai is Professor of History at Columbia University. She is author of the award-winning book, Impossible Subjects: Illegal Aliens and the Making of Modern America, published by Princeton University Press in 2004. She is the daughter of Chinese immigrants. 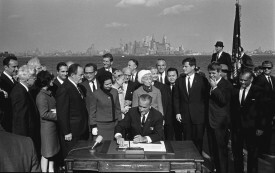 This Is How Immigration Reform Happened 50 Years Ago. It Can Happen Again. Recalling the civil-rights history of the Hart-Celler Immigration and Nationality Act of 1965 can help us think about how to change immigration policy today. History is full of examples showing that policies designed to exclude immigrants are doomed to fail.